ENERGYWORLD – SPE is the largest individual-member organization serving managers, engineers, scientists and other professionals worldwide in the upstream segment of the oil and gas industry. SPE’s membership includes more than 85,000 professional and 73,000 student members in 143 countries participating in 203 sections and 382 student chapters. SPE comes with a vision to advance the oil and gas community’s ability to meet the world’s energy demands in a safe, environmentally responsible, and sustainable manner. SPE’s missions are to collect, disseminate, and exchange technical knowledge concerning the exploration, development and production of oil and gas resources, and related technologies for the public benefit; and to provide opportunities for professionals to enhance their technical and professional competence. 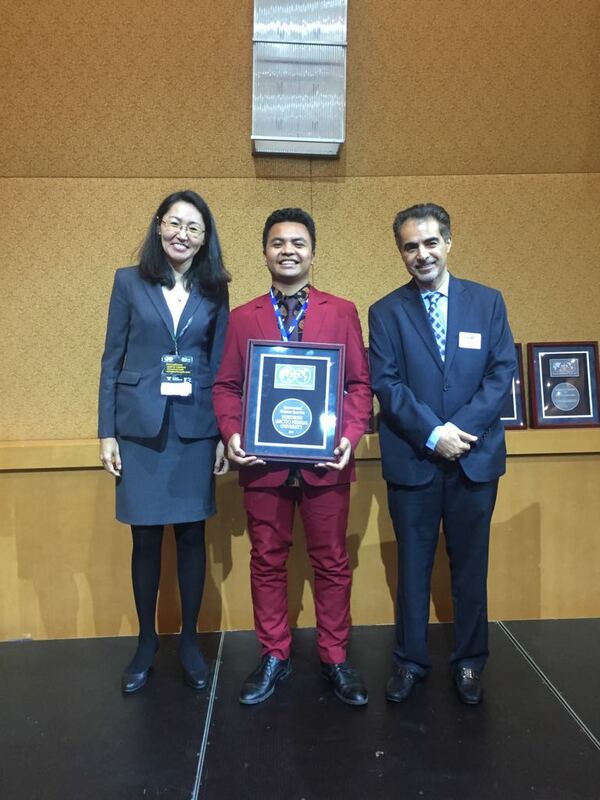 There was one pride on September 15, 2018, Muhammad Iksan Kiat as the 2017/2018 President of the Society of Petroleum Engineers (SPE) Student Chapter (SC) in Northern Arctic Federal University (NArFU) received the highest award “Outstanding Student Chapter Award” from SPE International for the successful one-year work period. The annual award was given directly by the President of SPE International Mr. Sami Alnuaim from Saudi Aramco and the Director of Russia and Caspian Region Mrs. Aizhana Jussupbekova from ExxonMobil at the SPE Russian Petroleum Technology Conference 2018, Moscow. The Outstanding Student Chapter Award (OSC) is presented to the chapters whose programs, activities, and levels of participation distinguish that chapter from others. As for the best SC or petroleum student organization model selection process (the top 10% of SC), there are five key indicators considered, including 30% industry engagement; 30% operations and planning; 15% community involvement; 10% professional development; and 15% innovation. In contrast to Texas A & M, Gubkin University, Bandung Institute of Technology, Gadjah Mada University, Moscow State University which also received the same award, the achievement of SPE SC NArFU was considered unique due to the following reasons: this chapter was born three years ago; its president is a foreign student; and it’s located far from the center of the petroleum industry. SPE SC NARFU is running on a Federal University base located in the Arctic region, Russia, where Iksan completed his bachelor degree with Red Diploma (Cumlaude) in “Operation and Maintenance of Oil Production Facilities”. Another question arose, how could Iksan, an Indonesian millennial, from Buru Island, Maluku, be able to study far away and make many achievements abroad? “Being born in a small village in the eastern horizon is natural. But fighting spirit, Indonesian soul and usefulness intention need to be cultivated. Alhamdulillah, my jihad was supported by great and caring people, like Mr. Ardian Nengkoda, Mr. Tutuka Ariadji and Mr. Ambassador Wahid Supriyadi. Those who always provide me academic guidance and motivation” answered the 2016/2017 Chairman of the Indonesian Students Association in Russia (PERMIRA), 2017/2018 Coordinator of the Overseas Indonesian Students Association Alliance in the America-European Region (PPI AMEROP), Member of the PPI Dunia Energy Study Team. Siwalima High School graduate is now pursuing Master degree in the best petroleum campus in Russia, “Gubkin State University of Oil and Gas” majoring in “Development Design and Operation of Gas and Gas Condensate Fields”. Not only that, Iksan also is following a double degree program with a specialization in “Economics and Management of the Oil and Gas Industry”. I believe that to fight for the nation’s energy sovereignty, a future engineer needs a comprehensive understanding of the energy industry, especially oil and gas, in other words, not only the technical knowledge we need to learn, but also international economics and politics as well as other complementary sciences, he explained.